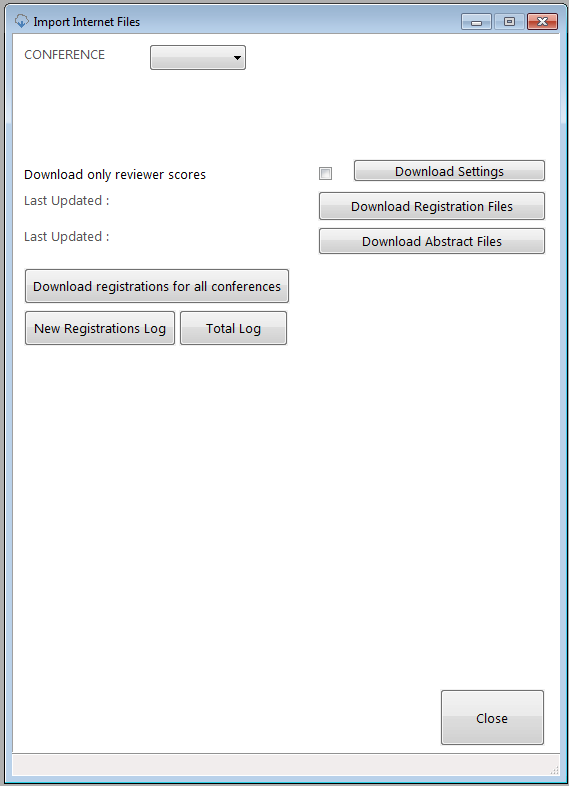 The button ‘Download registrations for all Conferences’ gives you the possibility to download all active conferences all at once. 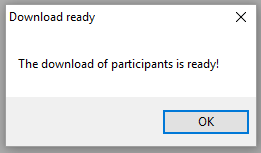 Only the download will be done, checking and importing the participants will not be done automatically. 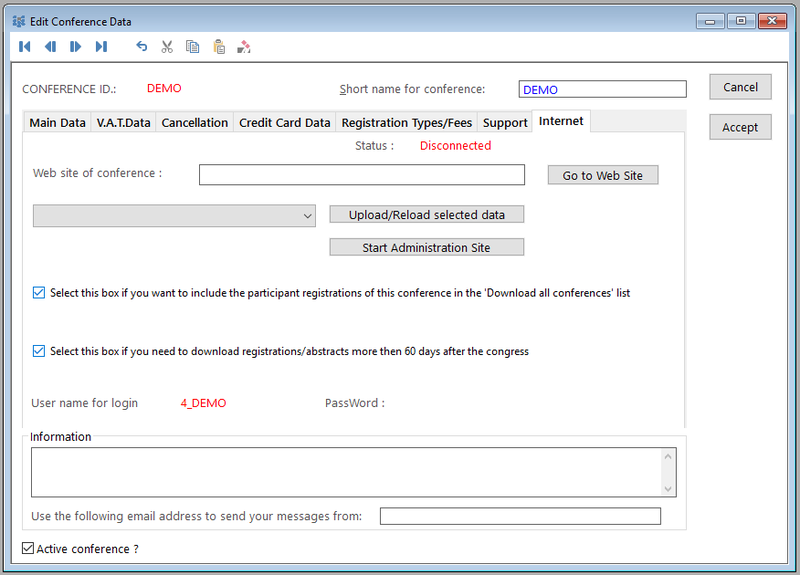 You can use the ‘Download registrations for all Conferences’ button once per 2 hours. By clicking this button you can start the download of the participants. After downloading the participants the registration data is stored in the 'Participant Data' section. From here you can decide to import individual registrations into Eventure. 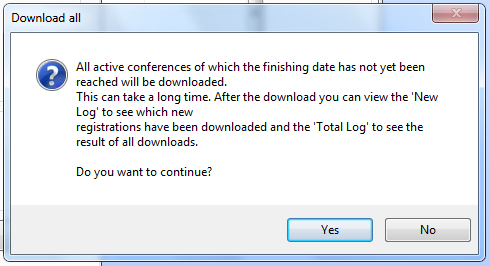 The field next to the ‘Last Updated’ label shows the last date you have downloaded participants. This section shows the status of the downloaded participant registration data. This section can show three different types of data: New participants, Skipped participants and Rejected participants. The box next to the ‘New participants’ label shows the number of new registrations that have been downloaded this time. The box next to the ‘Skipped participants’ label shows the number of registrations that you have temporarily skipped for reasons you have specified. The box next to the ‘Rejected participants’ label shows the number of registrations you have rejected. By clicking on the ‘Import New participants’, ‘Import Skipped participants’ and ‘Import Rejected participants’ buttons you can view the registration data and decide whether to accept the data, reject it or skip it temporarily (Skip). 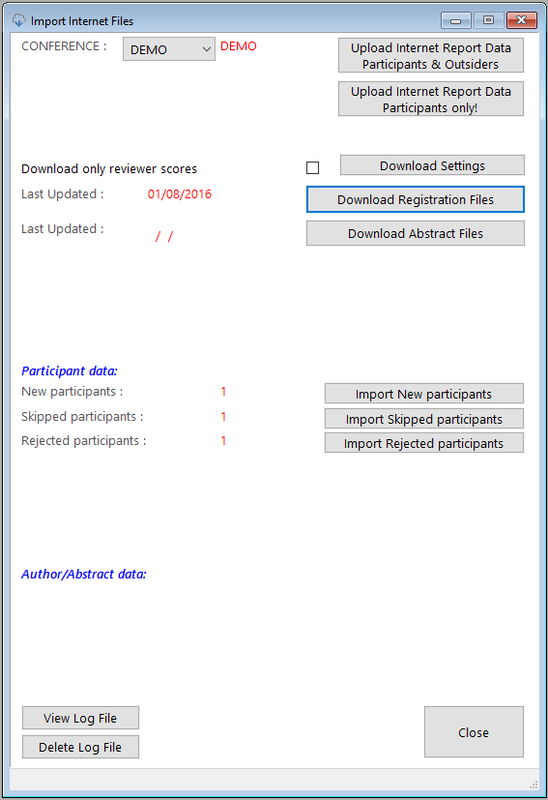 This shows the status of the downloaded abstract data. More information about downloading abstracts can be found here. When Eventure has downloaded the registration data from the Internet you will see the following message. Clicking on ‘OK’ will enable you to view and evaluate the registration data per registered participant. If you don't want a congress to be downloaded with the ‘Download registrations for all Conferences’ button, you can uncheck the box for 'Select this box if want to include the participant registrations of this conference in the 'Download all conferences' list'.